Online Consumer e-Seva provided by CSPDCL. Please register here for bill Payment. BP No. What is BP No. ? Amount of Last Bill Paid Rs. * Web Self Service (WSS) provided by Chhattisgarh State Power Distribution Company Limited (CSPDCL) is a free service for its electricity consumers. * WSS provides Online Billing and Payment Information at the risk of the Consumer. * Online data provided by WSS is for information purpose only. * Every care has been taken to ensure the accuracy of information furnished in WSS. However CSPDCL does not accept any responsibility and liability for any damage or loss caused to any person as a result of any action taken on the basis of this information. * CSPDCL shall not be responsible for any errors or omissions in the information provided on WSS. * CSPDCL make no representations about the completeness, accuracy, suitability, reliability, availability and timelines of the information contained on WSS for any purpose. All such information displayed are as is. * In case of any discrepancy, consumers are advised to cross check the information at the relevant CSPDCL office. * In no circumstance, the information gathered from WSS can be considered conclusive and therefore cannot be used as evidence for any purpose of any court case, litigation or any other form of complaint. * CSPDCL shall not responsible for any liability, monetary or otherwise, which may arise as a consequence of the erroneous information on WSS. * Content provided on WSS is highly secured through latest and updated IT security tools. However, CSPDCL is not responsible for any unsolicited content or activity that may be caused by unethical internet threats, which are beyond our control. * The terms and conditions may be modified by CSPDCL, as and when required, without any prior notice to the Consumer and the continued usage of WSS by the consumer shall be deemed to be an acceptance of the modified terms by the consumer. * CSPDCL reserves the right to suspend/ terminate WSS at any time at its sole discretion. * By registering at WSS Consumer has given consent to receive SMS/email delivered by CSPDCL for providing customer care services, as and when required. * CSPDCL respect the privacy of everyone who registered at WSS and are committed to maintain the Privacy of their personal information. * CSPDCL collects personal information such as First Name, Last Name, Date of Birth, Mobile No. and e-mail address etc during registration. * CSPDCL will not share any personal information to any third party. * To the extent required or permitted by law, we may disclose information in connection with security related or law enforcement investigations or in the course of cooperating with authorities or complying with legal requirements. * CSPDCL uses the personal information submitted by the consumer at WSS registration form for providing customer care services to them. 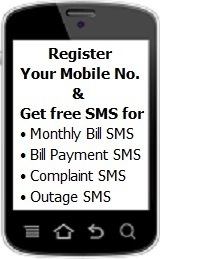 * CSPDCL shall use mobile no for informing the consumer by sending SMS at Bill Generation, Bill Payment, Payment Reminder, Complaint Registration, Complaint Resolution and Outage Information. Your call will be connected to the IVRS System. help for Online Consumer Registration.